I love this cartoon! Because I am a minister, I laughed and laughed. 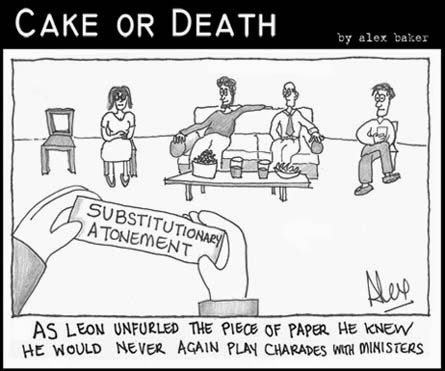 And then I began to notice a really good point here: You can't act out substitionary atonement! It's an unlivable theology. The Easter story tells us that Jesus' suffering on the cross is redemptive. He suffered and died that we might have life (i.e., he substituted for us in order to atone for us). Real love manifests as complete submission and self-sacrifice. God required of Jesus -- and may sometimes require of us -- passive acceptance of violence. That's a very common interpretation of the Easter story. I don't think this is really the message of that story. In charades, as in life, you need to show something -- be active. Easter is about transformation, not passivity; self-realization, not self-sacrifice. I don’t believe people come to church to stay the same. 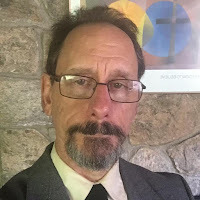 I don’t think that anyone joins a faith community and enters into congregational life as a conservative strategy for maintaining their status quo. If we wanted to stay the same, we could just stay home – just stay in that . . . tomb. The Easter message is to be risen, to be resurrected, to be transformed. A congregation must be about facilitating and bearing witness to one another’s personal transformations. A congregation must be about transforming its members, transforming itself, and transforming the world around it. I don’t believe you’re here to stay the same. But I don’t see you as here to deny who you are, either. The transformation is not about rejecting yourself. It’s about becoming more fully who you are. The point is expressed in our third principle: acceptance of one another and encouragement to spiritual growth. Our covenant is to accept one another – to take each other exactly as we are, for each of us is complete, beautiful, and perfect, lacking nothing, requiring no change. And: our covenant is to encourage change, spiritual growth. For perfection is not static. Your ongoing growth and change is a part of your perfection. Accept ourselves and each other exactly the way we are – and at the same time transform. At work in this process is the interplay between what is shared and what is unique to you. We share values, expressed in our principles, and encourage each other in living up to them. At the same time, becoming who you are is not simply a matter of getting better at exemplifying the values we share. It’s recognizing and living into the truth that only you see – as, in the Gospel of John, Mary, in her aloneness, comes to recognize Jesus. This is no easy thing, becoming who you are. But why isn't it easy? Why should it be hard? Nurtured by learned and shared values, supported by the love of family, friends, community, should not becoming who we are be a flourishing as natural and abundant as the flowers in spring? It’s hard because we carry shame. We are afraid. We have, in various ways and in varying degrees, been silenced from the full expression of who we are. Make the courageous choice to break the silence, tell your truth, rise up out of shame. Bear witness to the stories of others as they seek to break silence imposed by perhaps greater fear and shame. This finally is where the Easter story takes us. The death from which we may rise, from which we can help others rise, is specifically an entombment in fear and shame. Crucifixion was designed to inflict optimal physical pain, dragged out over many hours. The executioners sometimes even gave wine mixed with morphine to the victim, not to ease his suffering, but to keep him from passing out from pain so as to have to endure it longer. More than that, crucifixion was designed to humiliate. The person was stripped naked – lifted up to public view, gasping, fully exposed, utterly powerless. At the moment of death, his bowels would loosen, for all to see. It was violence, displayed as extremely as the Roman imagination could conceive, designed to instill fear, and to make anyone associated with the victim feel ashamed of themselves. For some of Jesus’ followers, it worked. In their fear and their shame, they fell silent about the promise of a new social order, a Kindom of God. Against all violence to body or to spirit, against all fear and shame endured by us and by others, against all the protective strategies we ourselves devise to be safe, there is rising to accept and affirm and speak who we are. There is yet the possibility of transformation into who we are, unobscured by fear or shame. There is yet the possibility of justice, an end to violence, a new social order, a Kindom of God. Here is a livable theology, a teaching that we can act out. Here is the message and the hope of Easter. This is part 2 of 2 of "Easter and Transformation"